The Allalin Glacier is a temperate glacier in the Vallese Alps (Switzerland). 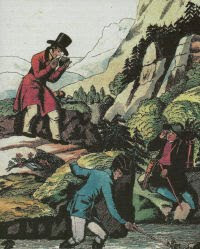 In the last centuries it became feared by its repeated advances and damming up of a melt water lake, which subsequently caused catastrophic outbursts floods. At the end of the 19th century the glacier began to retreat, and during the first half of the 20th century the frontal part of the glacier tongue rested on the brink of a steep (27°) bedrock slope. To prevent future inundations and to store the discharge of the glacier and use it to for a hydroelectric power plant, in 1964 the realization of a dam below the glacier fore field was decided. The construction works for the Mattmark dam began in 1965. Some days before August 30, 1965 small ice blocks were observed falling down the slope, but this was not unusual. On August 30. 1965, without warning, a major portion of the terminus of the glacier broke of, sliced down the rock slope and impacted on the huts of the construction site, 88 peoples working and living there were killed. Fig.1. The Allalin Glacier before the ice avalanche, with marked glacier terminus part that caused the catastrophe, on the left corner the huts of the construction site (figure from HÖFLER & WITT 2010). 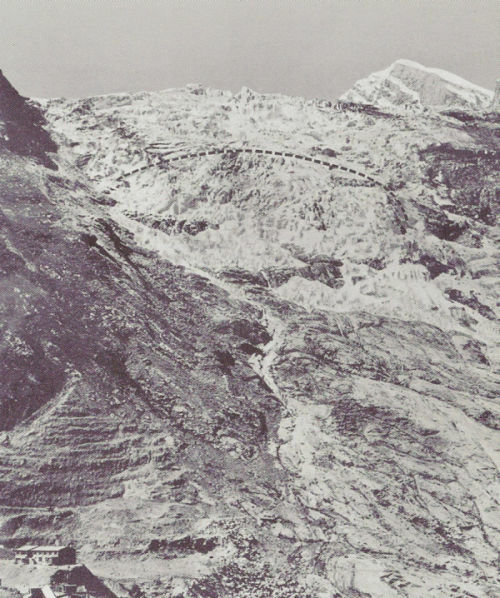 Subsequent investigations showed that the glacier avalanche occurred during a period of rapid advance of the glacier that started 2-3 weeks earlier, and pushed the front over a terrace in the bedrock. The glacier terminus slipped just on the margin of the steep slope, and became hold in place only by the connection to the glacier tongue. Finally the connection break off, the volume of the resulting ice avalanche was estimated to 1 million m3, and extraordinary and devastating event. Similar seasonal changes in speed have also been observed in the years after the catastrophe, and it is now known that Allalin Glacier speeds up regularly every 1-3 years, usually during summer or late autumn. The acceleration is attributed to enhanced sliding, forced by the abundance of melt water, the different accumulation of ice masses by differences in the bedrock friction and the fragmentation of the glacier ice during the warm season. In most cases however no large release of ice happens; evidently the speed-up event is necessary but not sufficient to cause breaking off. It is likely that geomorphologic factors, like the glacier bed topograpphy and a critical mass distribution inside the glacier, also contributed to the Mattmark catastrophe. After the catastrophe a monitoring project of the Allalin Glacier was initialized. In 1999 the glacier configuration was similar to 1965, and for security reasons the hazard zone was closed during summer. An ice volume of 160.000 cubcic meters did in fact fell of, but did not cause any damage. Despite the successful predictions in case of the Allalin Glacier, the mechanisms and relationships between glacier acceleration and break-off of large ice masses remain unclear, some steep glacier tongues switch between active and inactive phases, but other glacier tongues despite similar morphological conformations do not (for example the Giétroz Glacier in south-western Switzerland). Fig. 2. Profile showing historical retreat of Allalin Glacier, Switzerland, and source of the 1965 glacier avalanche. The avalanche killed 88 construction workers at the Mattmark Dam construction site in the Saas valley (from EVANS & CLAGUE 1994).